Garlic Herb Baked Pretzels are soft, warm and packed with flavor. Serve them with a batch of Cider Cheese Dip and your next football party is bound to be a winner! Don’t miss that special Silpat giveway too! This post is sponsored recipe development on behalf of Sasa Demarle, Inc. All opinions are my own. September is here and we are settling in nicely. This time of year, I am a walking, talking, Fall-loving cliche. Everything out of my mouth is apples, pumpkin, sweaters, and of course, football! We all know when football is in swing, so is some great party food. For the last 5 years or so, my family has had the tradition of having a fantasy football league between my parents, siblings and a few close family friends. There is usually a lot of smack talk and craziness leading up to the draft, which just adds to the good natured fun. Every season, my interest in the league starts off strong and then typically dwindles somewhere in mid-November when I realize that I started three players who are all out on injury. 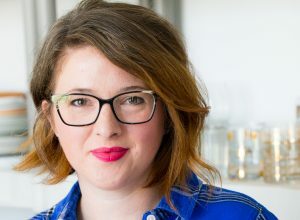 But in September, I am on top of my game, so to speak, especially when it comes to food. This year, I am looking forward to hosting a few of the Sunday football parties in our new home and I am already lining up my recipes. The first weekend will definitely feature a big batch of these soft Garlic Herb Baked Pretzels with Cider Cheese Dip. Oh, boy are these pretzels something special! I started with my very favorite baked pretzel recipe from Alton Brown and turned them into flavor packed Garlic Herb Pretzels. They have that great chewy crust and soft, pillowing insides that are just what I want in a soft pretzel. Now, before you get nervous about making pretzels at home, let me assure you, this is much easier than you think. True, there are several steps to this recipe, but none of them are difficult or take huge amounts of skill. As someone who often shies away from yeast recipes, this is one that works out for me time and time again. My favorite addition to this method, however, is the use of my Silpat® Perfect Pretzel mats. Are you familiar with Silpat® mats? They are an incredibly easy to use, clean, and care for mats that allow you to bake and cook just about anything and have fast clean up. Ever since starting to my Silpat® mats, I have cut down on my use of parchment paper which is great on my wallet and the planet. Woo hoo! 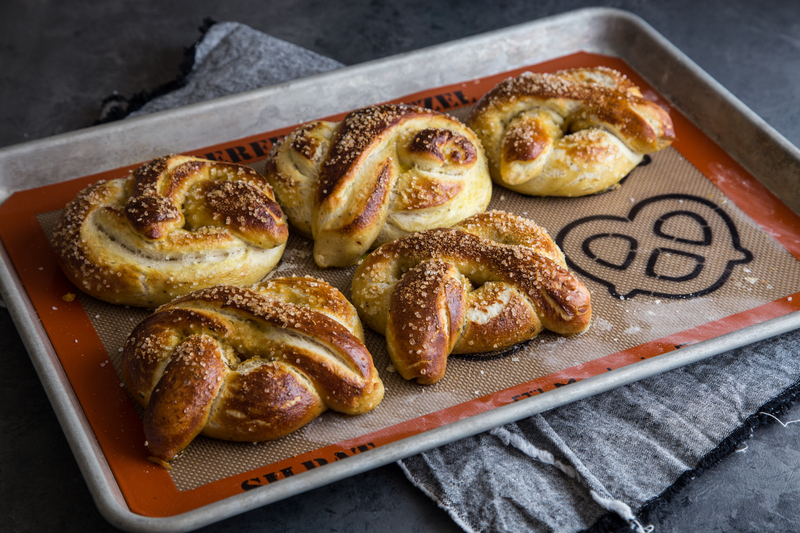 Using their Perfect Pretzel Mat in this recipe is very convenient because forming a pretzel can get a little tricky. Having the little pretzel outlines not only helps you to shape the pretzel, but it spaces them perfectly so your pretzels don’t stick together when they bake up to a puffed, golden brown. Now, let’s take a quick second to talk about this Cider Cheese Dip. This is my version of traditional “beer cheese” and with it being September and all, I had to swap out the beer for some great hard apple cider. Remember that bit about me being a fall-cliche? It’s real. It’s very, very real. Plus, it tastes sweet and tangy when paired with the cheddar, so it is more than worth it. 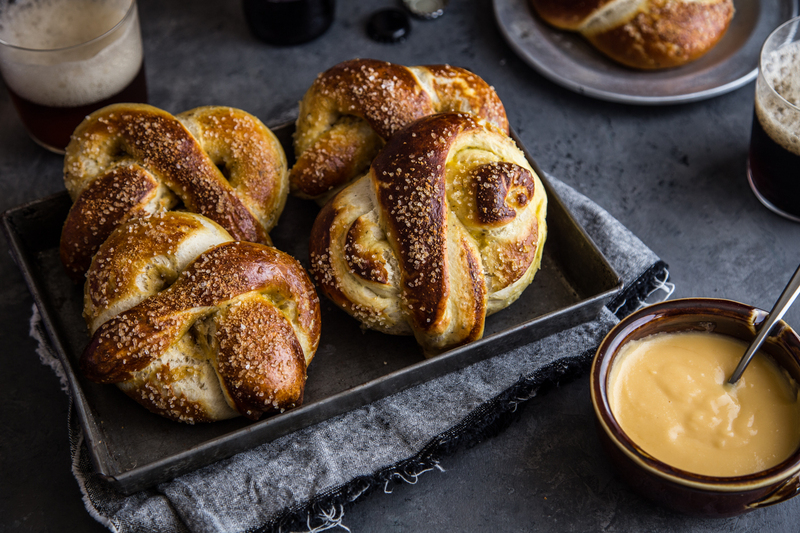 My plan is to make a batch of these Garlic Herb Baked Pretzels and Cider Cheese Dip to distract my family and hopefully I won’t be the only one bobbling my fantasy team. 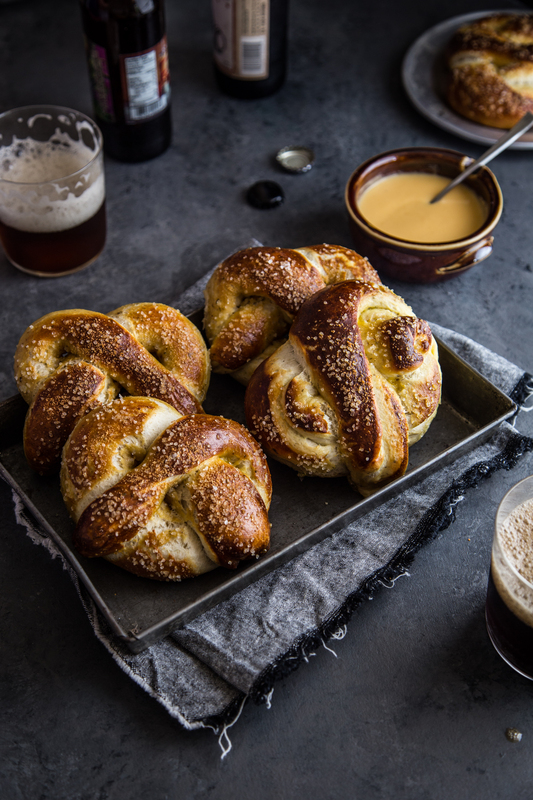 These pretzels are beyond perfect, love the cider dip too! These pretzels and cheese sauce look amazing! I love your photography and ideas. I hope my pretzels turn out half as good as yours look. Thanks! THanks, Karen! The pretzels take a few steps, but none of them are difficult. I am by no means a bread baking expert, so I love when I can have an easy to follow yeast recipe. Good luck! !